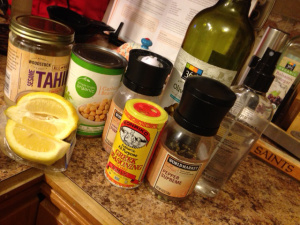 I grabbed the tahini, the garlic, garbanzo beans, ev olive oil, a lemon, some amazing Greek seasoning my Auntie Barbara gifted me with, and everyone’s favorite kitchen helper- Aloette Nutri Hydrating Mist! Wait, what? You don’t cook with NHM? Before you spritz your salad, let me explain! I don’t add it as an ingredient but it is pretty handy to have around.